For Latin American leaders, this year's UN general debate became a forum for widespread dissent and anger at U.S. policies that seek to control a hemisphere that has clear aspirations for greater independence. In a region long considered the United States' primary zone of influence, Washington's relations with many Latin American nations have gone from bad to worse under the Bush II and Obama administrations. And judging by the speeches at the General Assembly, they may be nearing an all-time low. The other target for regional antipathy was the signature U.S. security policy in the Western Hemisphere: the drug war. Even formerly stalwart allies like Guatemala, Mexico, and Colombia came out against Washington's drug war and called for alternative approaches. Brazilian president Dilma Rousseff led the charge against U.S. international surveillance activities on the first day of the general debate at UN headquarters in New York City. Information from the Snowden leaks revealed that the U.S. spy program in Brazil targeted President Rousseff's personal and governmental communications as well as the state-owned oil company, Petrobras. This understandably infuriated Brazil. One can only imagine the response in the United States if the tables were turned—"Brazil found spying on U.S. government and companies through private Internet and telecommunications companies." Rousseff called the program a breach of international law and an "affront to the principles that must guide the relations among friendly nations." She added that the U.S. program constituted "a grave violation of human rights and civil liberties; of invasion and capture of confidential information concerning corporate activities, and especially of disrespect to national sovereignty." Rousseff vowed to take measures to protect Brazil from U.S. spying in the future. Next up, Bolivian President Evo Morales not surprisingly went even further, questioning the U.S. commitment to diplomacy and democracy as it spied on its allies. "What kind of democracy is it when espionage services of the United States violate the privacy and security of other nations, using private companies. It turns out they not only spy on democratic governments, but on their own allies, even on the United Nations itself. I think this shows a lot of arrogance," the indigenous leader told the Assembly. Ecuador echoed criticisms of the spy program, saying that confidence had been seriously eroded by "the unlimited acts of the United States, through its spying on global communications" and demanding that the United States explain its surveillance programs. Bolivia and Ecuador criticizing the United States is a common occurrence since leftist parties took power in their respective capitals. But even Mexico—normally submissive due to its high economic and geopolitical dependency on the United States since NAFTA—used part of its moment in the international spotlight to warn against violations of the "right to privacy." Foreign Minister Jose Antonio Meade stopped short of mentioning the United States, calling for a full investigation and insisting that "the parties responsible be held accountable." Mexico has been muted in its criticism, but sent a diplomatic note when the leaks showed the NSA had targeted now-President Enrique Peña Nieto when he was running for office. On September 30, Jesselyn Radack of the Government Accountability Office read a statement from Snowden to the European Parliament as it takes up the issue of mass surveillance. "The surveillance of whole populations," Snowden wrote, "rather than individuals, threatens to be the greatest human rights challenge of our time." As a sign of its indignation, the Parliament recently nominated Snowden for its highest human rights award. "Right here, in this same headquarters, 52 years ago, the convention that gave birth to the war on drugs was approved. Today, we must acknowledge, that war has not been won," Colombian President Juan Manuel Santos said, noting that his country "has suffered more deaths, more bloodshed, and more sacrifices in this war" than almost any other. Santos, as he has done before, called for changing tracks rather than intensifying the war. He noted that he led the effort in the Organization of American States to study "different scenarios" (meaning alternatives to the drug war approach) and commissioned studies that will be made available to the public and evaluated in a UN Special Session in 2016. He concluded with a jab at the U.S.-led drug war. "If we act together with a comprehensive and modern vision—free of ideological and political biases—imagine how much harm and how much violence we could avoid," he said. Central American nations repeated the need for a new model. Costa Rica's Laura Chinchilla cited a regional agreement including Mexico and Guatemala "to reevaluate internationally agreed-upon policies in search of more effective responses to drug trafficking, from a perspective of health, a framework of respect for human rights, and a perspective of harm reduction." Guatemalan President Otto Perez Molina, a military man who has somewhat ironically assumed the mantle of drug reform champion, told the UN, "Since the start of my government, we have clearly affirmed that the war on drugs has not yielded the desired results and that we cannot continue doing the same thing and expecting different results." He called on nations to "assess internationally agreed policies in search of more effective results" and urged approaches based on public health, violence reduction, respect for human rights, and cooperation to reduce the flow of arms and illegal funds. Perez Molina openly praised the "visionary decision" of the citizens of the U.S. states of Colorado and Washington to legalize marijuana, and heralded "the example set by [Uruguayan] President Jose Mujica in proposing legislation that regulates the cannabis market instead of following the failed route of prohibition." Mexico's minister used the same terms, quoting the regional agreement and placing a priority on prevention, arms control, and opening a global debate. Bolivia's Morales noted that according to UN data, his country has made more progress on fighting drug trafficking "after liberating ourselves from the DEA," referring to his decision to expel the U.S. agency from Bolivia. Spying and the drug war weren't the only criticisms. Venezuelan President Nicolas Maduro cancelled his UN participation altogether, citing "provocations" against him and fears for his safety were he to visit the UN's New York City headquarters. His demand to move UN headquarters out of the United States was reiterated by other Latin American leaders. Tensions have been high between the United States and Venezuela despite the death of U.S. nemesis Hugo Chavez. Maduro just expelled U.S. chargé d' affaires Kelly Kiederling and two others for allegedly encouraging acts of sabotage against the Venezuelan electrical system and economy in meetings with right-wing groups. Criticisms of inaction on global warming were also aimed northward. Mujica of Uruguay lashed out at U.S. consumer culture, saying, "If everyone aspired to live like the average U.S. citizen, we'd need three planets." It's time to listen to what they're saying. The evident anger in the words of these Latin American heads of state shows just how far Washington's relations with the region have deteriorated. It demonstrates the growing gap between rhetoric and reality since Obama promised the region a relationship based on "mutual respect" and "self determination" at the beginning of his first term. Diplomacy, reaffirmed in the 68th Assembly, has been steadily eroding in U.S. relations with Latin America as the Pentagon dominates the agenda. Does it matter for the United States to have good relations with Latin America, including the left-leaning leaders? Apparently, Washington has decided it doesn't. Its defensive response to the spy scandal, its efforts to pit its free-trade allies against countries that have turned away from neoliberal economies, and its use of regional allies like Colombia and Mexico as proxy militaries has sought to create rifts rather than mend them. 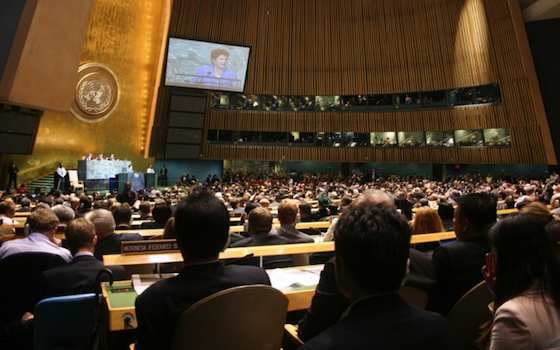 In-the-box Washington pundits view the hemispheric outburst in the UN as a PR problem. But the Obama administration doesn't need to work on its niceties or polish its Spanish. What it needs to do is ditch the offensive policies and practices that stirred up regional ire. The voices of outrage from the South brought an important lesson to the UN floor: Deception and strong-arm tactics eventually backfire.